In preparation for some changes in our office layout, I was interested to do a little research on various ideas on the topic. 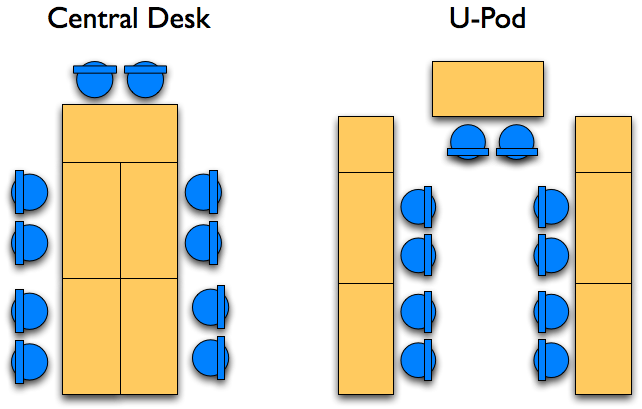 In Agile Software Development (2nd edition) chapter 3 (and 3.1), Alistair Cockburn describes a possible office layout - with the team room (programming room) having a central cluster of tables where pairs sit facing the center, with some more private areas on the side of the room. This is known as "Caves and Common". There's research backing this up in the book, rephrasing the Allen Curve (communication exponentially drops with distance) as the "school bus rule". That's the typical agile team room (blogged by Martin Fowler). This is sometimes also called a War Room. Another setup. Well, it probably goes with an open space for multiple teams. Cool idea of joining a whiteboard and special projector. Each team member can share their screens on the team board with a single button press. Martin Fowler blogged about another option of a U shaped space, where people face out side. While it is easier to roll over towards each other, it is harder to find a place for a team board. And avoid the corners, bad for pairing. Here's a recommendation by someone who tried it. This is sometimes referred to as "The Bullpen". Richard Cheng recommends half height cubicles. His slides show some additional options, considerations and aspects (I think he's missing the point of avoiding the corner made by Martin Fowler). In context of his slideshare, I think this is evangelized as an improvement to the previous single person cubicles. Right... Cool, perfect for focus and personal effectiveness, but totally optimized for working alone, inhibiting communication and collaboration. After the first wow effect, agile teams optimize for team results rather than individual performance. Dafydd Rees (the programmer) shares his experience with different arrangements covering more or less similar setups. InfoQ cites Mike Cohn on Workspaces for Effective Agility - not so much about the physical layout, but some aspects to take care of. 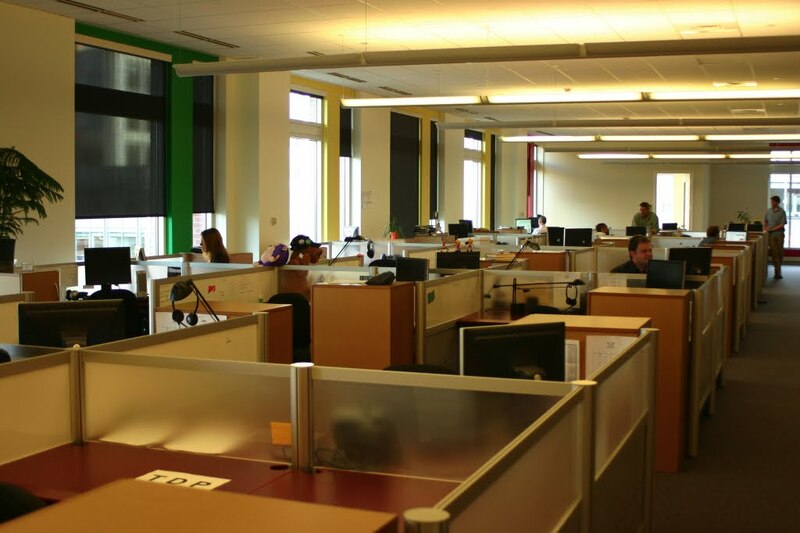 What's your experience with various office setups? A short clip case studying the Stanford design school, and their concept of the impact of the work environment on learning, engagement and teamwork. In 2010 I came across a brilliant radio show of This American Life - episode 403: NUMMI. It tells a story that's taught in business schools, of a joint venture by General Motors and Toyota - in 1984 these competitors decided to build cars together, each for their own reasons. NUMMI is the name of the factory, it stands for "New United Motor Manufacturing Inc". Act one tells the miraculous story of this GM factory in California - it was considered to have the worst work force, always striking, struggling against management, with no work discipline what-so-ever: drinking on the job, drugs, gambling. Then, Toyota stepped in and transformed this plant into a Japanese style plant, using the Toyota Production System (TPS) principles. The real miracle is that it worked - and that 85% of the work force was the same. This a truly inspiring story of human potential and how systems can be designed to bring the best or worst of of people. Act two is a different story. GM was for decades losing ground to Toyota. It had every reason to want to learn whatever they could from NUMMI and improve their quality across their other plants. This didn't happen - at least not fast enough. In 2010 GM went bankrupt. This part reveals some of the reasons and dynamics that led to the tragic outcome. I recommend investing an hour to listen to it. Act one tells you how to get it right, and it is really emotionally moving - the interviews with employees who went through the transition reveal NUMMI deeply changed the lives of many. It also describes some of the key aspects of the TPS and how it was successfully brought to the US. Act two is a handbook for nearly everything that can go wrong when you try to change an enterprise. What I like about this radio show is that it demonstrates so well that the Toyota Production System is not a "business process", or "best practice" you can see and replicate. It is a culture, with it's own values. It is not something you can just perform, it is rather something you can choose to become. Agile transformation often suffer from similar difficulties - you can follow the rituals, but if you don't get the underlying values and mindset, you just end up creating "cargo cults", or simply resistance. I'd like to thank Elliot Holar who shared this episode with me soon after it was aired - aside from this specific episode, I became quite a fan of This American Life. They rock. Thanks, e.